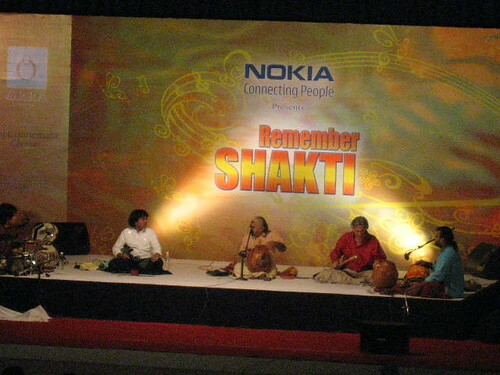 I went to different kind of concert in Chennai a couple of days back. This is the carnatic music season in Chennai and there is already boat load of kacheris that are happening. Amidst of all the classical stuff, a fusion concert appeared in the Chennai music scene. The fusion program by Remember Shakti brought in the some of the best in the industry. The show was great with solid performance from all around, but I was completely floored by the superlative performance of Ustad Zakir bhai. He handled Tabla & Drums at the same time with ease and marching them to different beats. I wonder, how he was able to send different signals to both of his hands at the same time. Overall, the performance was great and thoroughly enjoyed it. One request for next time.. Please start on time.. The program was set to start at 7:00 PM but didn't till 7:45 PM. It was a horrible waste of time all around. 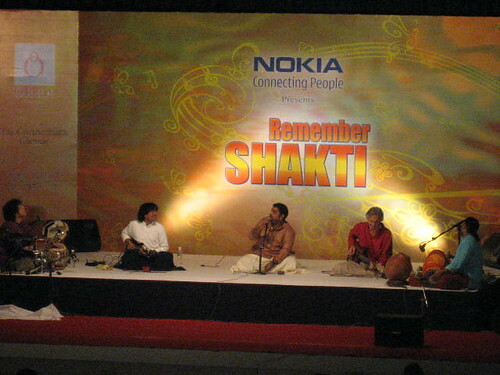 Ustad Zakir Hussain on Tabla & Drums, U Srinivas on Mandolin, Shankar Mahadevan - Vocal, John Malaughlin on Guitar and Selva Ganesh on Ganjira, Gatam & Mirudangam. Special appearance by Vikku Vinayakram. Short Clip from the performance. I enjoyed the fusion music. Thanks for sharing with us. Its simply a mind blogging confluence to hear the best of breed in shakti whose first performance with L hankar , Zakhir and Jon Mclaughlin started way back in 1975. They were ahead of their times in fusion music, only now it is being recognized with new members like Selvaganesh, Mandolin Srinivas and more recently Shankar Mahadevan in the team. Thaks for sharing for those who are not in Chennai and missed the show! Didn't realize this group is quite old.. thanks for the info..